Happy Moments Card + WCMD Giveaway! Happy October and World Card Making Day! It’s Amy here with a scrappy Happy Moments card! I have a big surprise with a giveaway to celebrate World Card Making Day so stay with me until the very end! I’m a huge fan of tape, so my project includes washi tape. Isn’t it perfect with my project? It’s a seamless addition to the design and matches perfectly, don’t you agree?! I layered some twine on top…do you see the notches I punched on the sides? That is a great way to keep your twine in place. I used the E-Z Runner® Permanent Strips Refillable Dispenser to adhere all the panels together. The sweet gnome is on a 3D Foam Squares White Mix. This entry was posted in 3D Foam Squares, Adhesives, Cards, E-Z Runner® Dispensers and tagged 3D Foam Squares Mix White, 3D Foam Squares Regular White, 3D Foam Squares Small White, Amy Tsuruta, Card, E-Z Runner Permanent Strips, E-Z Runner Permanent Strips Refillable, E-Z Runner Permanent Strips Refillable Value Pack, Giveaway, May Arts Ribbon, Memory Box, Prize, Simple Stories, Tissue Tape Denim and Flowers, World Card Making Day. Bookmark the permalink. 98 Responses to "Happy Moments Card + WCMD Giveaway!" Such a great card and AMAZING products! Thanks for the chance to win! He is too cute! I love your foam squares and use them on about everything! I love this cut e paper! I’m a huge fan of Scrapbook Adhesives dimensional foam dots, but the denim tape is very cool! Great card! I use your E-Z Runner on most of my projects. My go to adhesive is your EZ Runner! Thanks for the chance to win! Thanks for your giveaway. I love the E-Z Runner. Also use the 3D squares a lot. Sweet card, Amy! LOVE those super cute gnomes and beautiful Denim Tissue Tape. My favorite adhesive got to be the E-Z Runner Grand, because I’m tired of running out of tape runner very fast :). I’m addicted to dimension and one of my go-to adhesives are small 3D foam squares … and much, much more!!! Hey Gnomie!! I use those lil foam squares like a dieter eats tic tacs. Super dorbz card!!! I always have an assortment of 3D foam squares on hand. I also like the mounting squares but haven’t refilled my stash of those yet. My go to adhesive is the EZ runner and I can’t live without my foam squares! Thanks for all the great products and for a chance to win! Happy WCMD! Oh, this is sooo cute! I love 3d foam squares!! The 3-D Foam Squares and EZ Runner are my must-have’s for cardmaking! Love the gnome card Amy! Very cute card! Never can have too many foam squares, now I have to check out the EZ Runner Grand. LOVE the EZ Runner! PErfect for my needs!! My go to adhesive is usually the tape runner from Stampin’ Up! But I haven’t tried these yet, so if I win it just might change! Thanks for the chance to win and try new adhesives! Sooooooooooooooo cute! LOVING the gnomes!!!!!!!!!!!!!!!!!!!!!!! Your 3-D foam squares are the only ones I’ll use! They are the best! Love all of your products! Cute card! I love foam adhesive squares but I just saw the E-Z micro tape runner this week and I can’t wait to try it out. This could become my new got to adhesive ; ) Thanks for the chance to play! Of all the Scrapbook Adhesives by 3L products in my stash, I use the EZ runner permanent strips most often. Great card. Love the denim tissue tape. My go to adhesive is the E-Z runner. This card is just absolutely adorable!!! I love my EZ Runner…my definite go-to product! I have got to get some of these adhesive products. They look so helpful and easy to use. Use a lot of your products – the tape runner, the different sized foam shapes. I’d be up a creek without a paddle is I didn’t have all of them. ALL of your products are my go to adhesives! I love each of them but the EZ Runner Grand has practically become glued to my hand when I am creating!!!! LOVELOVELOVE your adhesives! Fun card. 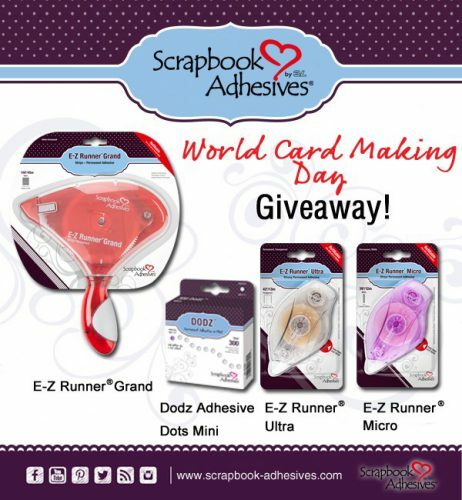 I love all the products, but the EZ runner is my adhesive for making cards. Tried other competitor brands with no success. I love the foam squares and Dodz for adhering animals, flowers etc. to my cards. Thanks for the chance to win! The Ez Runner Grand but that’s just the beginning then I go to what ever product I need based on my project. It’s good to know I can count on any of yor products to stick and stay stuck. I live n AZ and It is very dry a good part of the time which reeks havoc on many adhesives not holding up well. I know I can always count on your products to hold up any time any where thanks for that. Also what a super adorable gnome card. I love that denim tape it’s the perfect touch! Of course how could you not pop up that big adorable gnome tfs. I have to favorite products the EZ Runner and the Stick sheets that I use especially with word die cuts. Thanks for the chance! 3D Foam Squares are a must. Really cute card! Great card, love the colors and layout deign! I love love love the E-Z Runner Grand. It is my main go to adhesive for all my paper project. I am a huge fan! I love your 3D Foam Squares and use them all the time! Love the dimension they add! Love these adhesives. Always have . Always will ?? Love your tape runner….love everything…..would love to win !! I really love the mini glue dots. I use them very often! Very cute card. I like the crafty foam tape in white and black. They’re perfect when I need thin pieces of foam for shaker cards. Love your card, so cute. My go-to products are the E-Z grand (anything smaller would be lost on my table) and Foam Squares (as everything needs dimension). Can you tell by my name that do LOVE my adhesives! I love the Mini Dots! I wouldn’t be without 3D foam squares. They are the best foam squares on the market by far. Love the ez runner!! And absolutely love all your products! Super cute caed! Gnomes are so fun. I love using your tape runner. These little gnomes are simply adorable. And how cute is that card? Thank you for your generous giveaway! One of my favourite products is the Dodz mini dots! But I have many…. 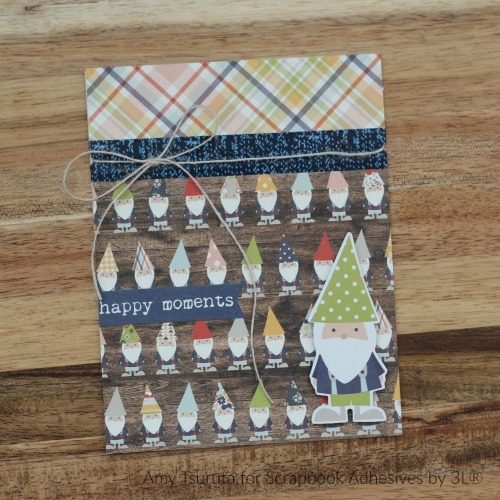 Love the adorable gnome card and especially that tissue tape from Donna! My fav’ adhesives I use on every projects are Dodz, and 3D Foam Squares. You make great products and I love them! Amy’s card is simply adorable!!!! My favourite are 3D foam squares. Thanks for this great chance to win!!! I love the Dodz and 3D Foam Squares. Absolutely gorgeous and very, very cute! My favorite go-to adhesive is your EZ Runner Ultra! Also love your 3D foam squares! Such a cute card !!! My go to adhesive has to be the tape runner. I do love tape squares for some pictures if I am not sure exactly where to place them..
Oh how nice, Thanks for the chance to win!!!! My go-to adhesive is usually Tombow mono liquid or a tape runner or whatever is out on my table at the time. I would love to win the EZ runner. Thanks for the chance to win. I love these sweet gnomes – such a cute card. I love using the foam squares – just can’t have enough of them! My go to product is the EZ runner permanent strips, I’ve used it for a long time and I love it! Amy’s card is adorable, I love the gnomes! happy wcmd to you! tape runners are my fave. so easy to use! Such a great card, Amy! And yes! That Girlie Grunge Denim Tissue Tape is perfect with it!!! Love this awesome inspiration!!! Thanks so much and Happy WCMD, one and all!!! I like the tape you put out that I can’t find very many places! It’s not on a roller but is easily torn with a blade in the carton! Oh, I love gnomes and this care is adorable! my favorite adhesive is the EZ runner micro because I can keep one in my craft bag at all times. My 6 year old can even use it! My favorite go to product is E-Z Runner® Permanent Strips . I love how you can go around corners and circles in a fluid motion. I like your Dodz mini dots. My fave product is the mini Dodz! Best things ever!! That is just too precious! you did a FANTASTIC job! Thank you for sharing your talent with us! My E-Z dots permanent refillable-I use it all the time. The keepsake envelopes are a new love. I can see that I need both the dispenser and the foam squares. My next craft purchase. I’ve been using soon Wang which is great, but always have to peel it. Thanks for advertising these with Amy’s cute card. I love the foam squares and I use the red tape runner too! I love your products! Thanks for the chance! love the card, gr8 giveaway!! Thanks for the opportunity to win my favorite adhesives! I use the EZ runner grand and the small red refillable tape runners. I love my EZ runner grand and the Dots mini! Awesome products that you make! !I hope to have the EZ Runner..Thank you for this chance to have your fun product.. I LOVE your 3D white squares for adding dimension to my projects. I love the permanant runner strips and I use a ton of foam squares. Love the gnome card! They are so cute. Cute card! Thanks for giving us a chance to win some great products. Cute card! I need to win so I can have a favorite! I like the E-Z Runner Ultra. Cute card..love the gnome..and the tape is really cool.. Totally fun and sweet card and awesome giveaway!